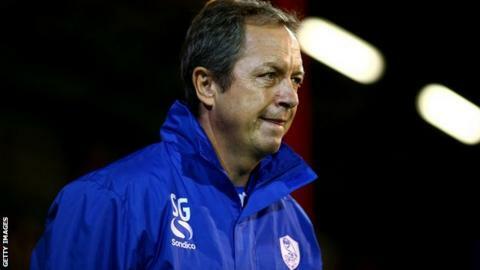 Sheffield Wednesday's search for a second home win of the season goes on after they were held to a goalless draw by local rivals Rotherham. The Owls, winless in nine, have gone over 400 minutes without a home goal. Jeremy Helan and Stevie May both went close for the hosts who nearly went ahead when Millers keeper Adam Collin nearly sliced Kirk Broadfoot's backpass into his own goal. Paul Green headed the visiting side's best chance wide. Stuart Gray's side, who were sixth after their last win over Reading on 20 September, had the first chance of the game but Gary Taylor-Fletcher flicked Helan's cross just past the post. The Millers should have taken the lead when Ben Pringle's corner found Green unmarked but the Republic of Ireland international headed wide. The hosts nearly broke their home duck in bizarre circumstances when Atdhe Nuhiu pressurised Broadfoot into over-hitting his backpass to Collin who saw his sliced clearance go just wide. Frazer Richardson and Paul Taylor both went close for the visitors before Helan and Glenn Loovens had chances for the hosts. The home crowd cried for a penalty when Kieran Lee appeared to be felled in the area by Broadfoot but they had to settle for a point that sees them move up to 13th. The draw stretches Rotherham's winless run to five. "I was looking for the referee to give a penalty for us. I was looking at the reactions, it's not just one player, it's five players. "It was a tight, tight game in a local derby and the penalty would have come at the right time to get our noses in front. "Kieran Lee is not one to talk much but he has said to me that it was a definite penalty. "Why would he go down? He'd turned the boy with a great piece of skill, his next job was to shoot at goal. "They are the big decisions, we are disappointed. They are the little margins we aren't getting at the moment." "We are disappointed. We have worked on a system and shape that's worked and for a period in the first half we have almost laid siege in their half. "But chances come and if big chances are missed that makes the difference in a derby. We worked especially hard on set-plays. "We go away a little bit frustrated that we didn't take advantage in the final third." Match ends, Sheffield Wednesday 0, Rotherham United 0. Second Half ends, Sheffield Wednesday 0, Rotherham United 0. Attempt missed. Atdhe Nuhiu (Sheffield Wednesday) right footed shot from the centre of the box misses to the right. Assisted by Jacques Maghoma with a cross. Attempt saved. Stevie May (Sheffield Wednesday) right footed shot from outside the box is saved in the centre of the goal. Josè Semedo (Sheffield Wednesday) wins a free kick in the attacking half. Offside, Rotherham United. Ben Pringle tries a through ball, but Alex Revell is caught offside. Attempt saved. Stevie May (Sheffield Wednesday) right footed shot from outside the box is saved in the bottom right corner. Assisted by Jacques Maghoma. Attempt missed. Paul Taylor (Rotherham United) left footed shot from outside the box is too high. Offside, Rotherham United. Alex Revell tries a through ball, but Lee Frecklington is caught offside. Attempt missed. Glenn Loovens (Sheffield Wednesday) right footed shot from the centre of the box misses to the right. Assisted by Kieran Lee with a cross following a corner. Corner, Sheffield Wednesday. Conceded by Adam Collin. Attempt saved. Jeremy Helan (Sheffield Wednesday) left footed shot from the left side of the box is saved in the bottom left corner. Assisted by Giles Coke. Attempt missed. Joe Skarz (Rotherham United) left footed shot from outside the box misses to the right. Offside, Sheffield Wednesday. Keiren Westwood tries a through ball, but Atdhe Nuhiu is caught offside. Attempt missed. Liam Palmer (Sheffield Wednesday) right footed shot from outside the box misses to the right. Assisted by Atdhe Nuhiu following a corner. Corner, Sheffield Wednesday. Conceded by Frazer Richardson. Corner, Rotherham United. Conceded by Glenn Loovens. Attempt blocked. Paul Taylor (Rotherham United) right footed shot from outside the box is blocked. Substitution, Sheffield Wednesday. Kieran Lee replaces Chris Maguire. Attempt missed. Alex Revell (Rotherham United) header from the centre of the box misses to the right. Assisted by Ben Pringle with a cross. Attempt blocked. Ben Pringle (Rotherham United) left footed shot from the centre of the box is blocked. Assisted by Paul Taylor. Corner, Rotherham United. Conceded by Jeremy Helan. Attempt missed. Frazer Richardson (Rotherham United) right footed shot from the right side of the box is too high. Assisted by Alex Revell. Attempt blocked. Stevie May (Sheffield Wednesday) left footed shot from the centre of the box is blocked. Assisted by Chris Maguire. Attempt missed. Ben Pringle (Rotherham United) left footed shot from outside the box misses to the right. Assisted by Richard Smallwood with a headed pass. Chris Maguire (Sheffield Wednesday) wins a free kick on the right wing. Offside, Rotherham United. Adam Collin tries a through ball, but Alex Revell is caught offside. Foul by Stevie May (Sheffield Wednesday). Attempt saved. Paul Green (Rotherham United) header from the centre of the box is saved in the centre of the goal. Assisted by Ben Pringle with a cross.